The Santa Ana Chamber of Commerce presents this special address by the city’s chief executive to hundreds of business leaders. Community-minded businesspersons have a chance to show their civic pride and support for the city by attending the State of the City event. Each year, Mayor Pulido shares up-to-the-minute news and anecdotes outlining the civic progress made during the past twelve months, as well as future goals and projects. Representatives from companies sponsoring the event and their colleagues will enjoy networking with leaders from the governmental and educational sectors. This year’s title sponsor is THINK Together. Bronze sponsors include First American, RSI and Westfield MainPlace. Corporate sponsors include Attentive Home Care, C&C Development, Citizens Business Bank, Crevier BMW, Chevron, Crevier Classic Cars, Everest College, Farmers & Merchants Bank, Griffin Related, ICI Development Company, Kaiser Permanente, Net Development Co., Rancho Santiago Community College District, Ronald Blue & Co., Southern California Edison, State Farm Eddie Quillares Agency, Summit HR & Payroll, The Gas Company, U.S. Rigging Supply and Waste Management. Nonprofit sponsors include Goodwill of Orange County, Santa Ana Unified School District, UC Irvine Career Center, and Vanguard University. The event is now sold out. 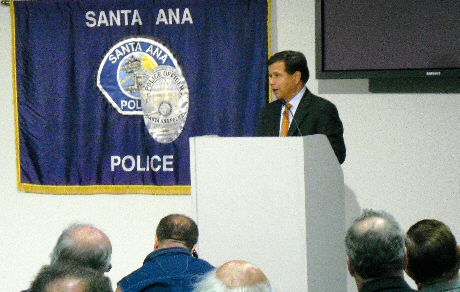 Highlights from the Mayor’s State of the City address will be seen online at www.SantaAnaChamber.com.